Utsunomiya (Japan) Sep 16 (IANS) Not many tech geeks or journalists have been inside Canons sprawling lens factory in the picturesque town of Utsunomiya - the capital of Tochigi Prefecture in the Kanto region of Japan -- about 100 km north of Tokyo. It takes two hours by road to reach the massive facility that has been in existence since 1977 --making the EF (Electro-Focus) lens mount which is the standard lens mount on the Canon EOS family of SLR film and digital cameras. The company has sold over 90 million EOS cameras and more than 130 million EF lens so far and the credit goes to the Utsunomiya plant -- and its "Takumi" or senior architect Toshio Saito -- who arrived at the facility in 1981. Saito who has been involved in the craft of optical lens processing for nearly 37 years joined Canon with assignments in lens polishing and was appointed chief of EF lens polishing in 1987. "To be in this kind of tough job you need to actually love lens polishing learn the craft of lens design and understand manufacturing processes which takes years to achieve. Since I am the â€˜Takumi I now want to instil the same passion I have had into my fellow workers " Saito tells a group of visiting journalists -- a first in the history of the plant. The master oversees the polishing of all the lenses that Canon produces at the plant. "The three processes that you are witnessing today -- lens processing assembly and SWC (sub-wavelength coating) -- is something that needs 100 per cent precision and utmost attention. For me the job brings joy to my life and I feel great to be producing lenses for the world to see through " adds the â€˜Takumi . Currently working in the process planning stages of the super-high precision lenses the "Takumi" also oversees the training of next generation of plant workers. The plant is a shining example of Japanese culture of cleanliness and punctuality. Before entering the lens-making floor the group was asked to wear lab coats hair and face masks and walk through an air shower to blow dust and other particles off. 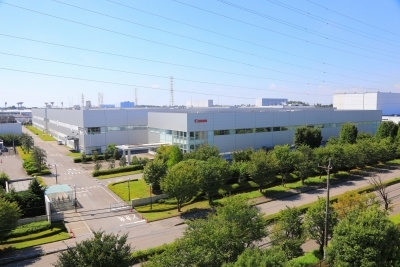 According to Shingo Hayakawa Deputy Group Executive Lens Business Group at Canon the plant is producing hundreds of lens every day though he did not divulge exact numbers. "Currently we have achieved near 100 per cent strive rate when it comes to SWC. We will soon achieve full strength in eliminating ghosting or lens flare in images " says Hayakawa while greeting the group. Canon has developed SWC capabilities on premises. When used on lenses with large angles of incidence/exit glare and ghosting -- which otherwise cannot be corrected with conventional coating technology - SWC coating significantly reduces lens flare and improves picture quality. Over the course of Canon s more than 80 years of history the unique core technologies at the company has resulted into the creation of nine fields of R&D which includes optical technologies and image communication technologies. The R&D facility situated right across the manufacturing plant is inaccessible as this is where the top minds work in utter silence to keep Canon moving. In 2003 Canon introduced the EF-S lens mount a derivative of the EF mount that is strictly for digital EOS cameras. In 2012 Canon introduced the EF-M lens mount a derivative designed exclusively for mirrorless interchangeable-lens cameras. "With our EOS series that has been in the existence for 30 years we have been able to help our customers preserve photos and videos like never before. "The new lenses that we are working on will bring superior experience for them " says Naoya Kaneda Advisory Director Group Executive ICB Optical Business Group Image Communication Business Operations Canon. The company is now producing Next-Gen RF lenses which offer higher quality and speed with a performance optimised for full-frame mirrorless EOS R camera - the company s first such product to take on mirroless camera leaders Sony and Nikon. There is not much cost difference between producing AF and RF lenses inform the company executives. The RF lenses however are fast and bright with unique qualities that offer new levels of intuitive control. RF or Rear Focusing is a system in which only the rear lens group moves to achieve focus making the auto-focus smoother and faster. As the company takes a giant leap with its full-frame mirrorless camera EOS R the never-tiring "Takumi" is ready with his next challenge. "Let us pray that the EOS series lasts another 30 years " says Kaneda and the "Takumi" smiles with glitter in his eyes.